I may be the only person you know who, as a young adult, snuck out of her parent’s home to go to church. It’s not that my parents had anything against church; I was raised by an inveterate Sunday School teacher, after all. But I wasn’t sneaking out to go to my home church. I was sneaking out to go to the local Metropolitan Community Church—a denomination comprised primarily of LGBTQ people, their families, and allies. I was in the early stages of coming out as a lesbian and the Metropolitan Community Church offered me a place to work through the crisis of faith created in me by predominant “Christian” attitudes and behavior toward LGBTQ people. I’ll always owe the Metropolitan Community Church a debt of gratitude. Even though I don’t particularly identify with its leading theologies, I recognize how that church helped me keep faith. They set a feast and invited me to eat, drink, pray, and sing. When they share communion in the Metropolitan Community Church, they gather in family groups (however “family” may be defined by those particular people in that particular moment). In small circles, they receive the bread and cup and pray with one another. I quickly found there was always a place for me in those groups. Even on my first visit, I was gathered in by brothers and sisters who recognized my struggle and welcomed me wholly. They welcomed my tears and terror, my laughter and joy, my body and soul. They embraced me at the table and I found my aching, yearning self made whole in the sharing of bread, wine, and tears. Now it is strange, as a member of a Mennonite Church USA congregation, to read about The Lord’s Supper (Article 12) in our Confession of Faith. Strange because the very document that teaches me how Mennonites come to the table also suggests my family is not quite welcome at the table (Article 19). There is so much good about Article 12 in the Confession. As Mennonites, we focus on reconciliation, discipleship, confession, redemption, gratitude, and the proclamation of the Gospel story when we speak of the communion meal. There is a special emphasis on community—on the one body we are invited to nurture when we remember together that we are sustained by the bread of life and the cup of the new covenant. As individuals, we look back on our baptism. As the gathered body, we recognize and name the violence of empire, then peer with wonder into the empty tomb of our brother, Jesus. As Christ’s church, we look forward to God’s coming realm of love and justice. Article 12 even suggests that all “who have been baptized into the community of faith, are living at peace with God and with their brothers and sisters in the faith, and are willing to be accountable in their congregation” are invited to the table. In my home congregation, the Saint Paul Mennonite Fellowship, I know that to be true. In my congregation’s conference, the Central District Conference, I know that to be true. But is it true everywhere in MCUSA? Is my family welcome? Does the “peace” of the table include me, or is it established at my expense? 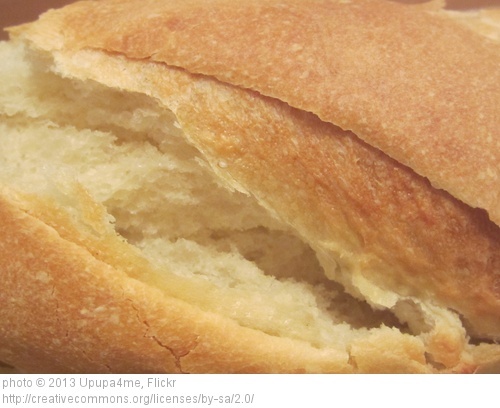 When Mennonites break bread together, how do they envision the coming realm of God—does it include the likes of me? Can we, as Mennonites, have a family table if some are left under the table to eat the crumbs? If I showed up at your table, would you gather me in like they did at the Metropolitan Community Church all those years ago, or would we run headlong into a theological debate over the ecclesiastical combat zone that is my body? Bodies are what this is about. And not just Article 19, but Article 12. Especially Article 12. The Lord’s Supper, as Jesus taught us, is about bodies: bodies gathering, bodies washing and being washed, hungry, tired, fearful, hopeful bodies. It is about bodies touching one another, bodies sharing bread and wine, bodies choosing one another in a time of risk and terror when those very bodies have been judged threatening to the empire. It is about opening our eyes to the violation of bodies by those who hunger for power. It is about tending bodies, wounded, dead, and risen, touching and believing in the power of God to redeem us. We dare not make the Body of Christ an esoteric notion. It is our Anabaptist proclamation that we meet Christ in our brothers and sisters, so let us not forget that the communion meal is about God incarnate—not remote, not safely removed, but God incarnate in Jesus’ fragile body, living in a world of violence, God incarnate in yearning bodies waiting to be welcomed to the table, God incarnate in the Body of Christ that we are called to make whole by setting a feast for all. This post is part of a series in which LGBTQ Mennonites reflect on the Confession of Faith in a Mennonite Perspective. Absolutely, breathtakingly beautiful. Thank you, Lisa. You make me want to be part of that Body. As one who works a lot with the topic of how Mennonites celebrate communion, I find this very moving. Blessings, wisdom, and grace to all of you as you meet as the broken body of Christ in Kansas next week.